When the HOSH series was first announced, Carmen certainly made very good sense for an arena style staging. Fond memories are held of Victorian State Opera’s excellent 1990 production at Melbourne Tennis Centre. Edwards and team have created a fully realised extravaganza, complete with a huge cast of singers and dancers, brightly coloured costumes, and, of course, spectacular fireworks. As an Event, with a capital E, the whole evening really cannot be faulted. So close to the city and still feeling secluded and special, the venue is perfect, and the harbour setting must be one of the most spectacular in the world. The audience’s entrance and exit are very smoothly organised, catering is lavish and the multiple dining and drinking spaces allow the crowd to see and be seen in great style. Almost as if operated on cue by the backstage crew, the light slowly dims as show time approaches, revealing a glittering city backdrop complemented by the iconic Bridge and Opera House. Sydney even turned on a very appropriately sultry evening on opening night to complement the passionate Spanish setting of the opera. Set behind the giant red letters spelling out the name of the iconic anti-heroine, the action transpires on a giant, blood spattered bullring, which menacingly brings the tragic finale to the foreground throughout the night. A tank and an army jeep, impressively delivered by crane during the rousing overture, make it clear that we are not in the original 1820s setting. Set designer Brian Thompson also makes clever use of a shipping container, keeping the industrial, working class feeling throughout the piece. Julie Lynch has designed suitably eye-popping costumes, which complement the broad strokes of outdoor storytelling perfectly. Some of the bling seems to be there just for spectacle, but the 1940s glamour proves an inspired choice overall. Highlights include Carmen’s voluptuously feminine final red dress, the set of yellow and black polka dot Paris chic dresses for the toreador parade and the contrasting purity of Micaela’s simple blue dress. 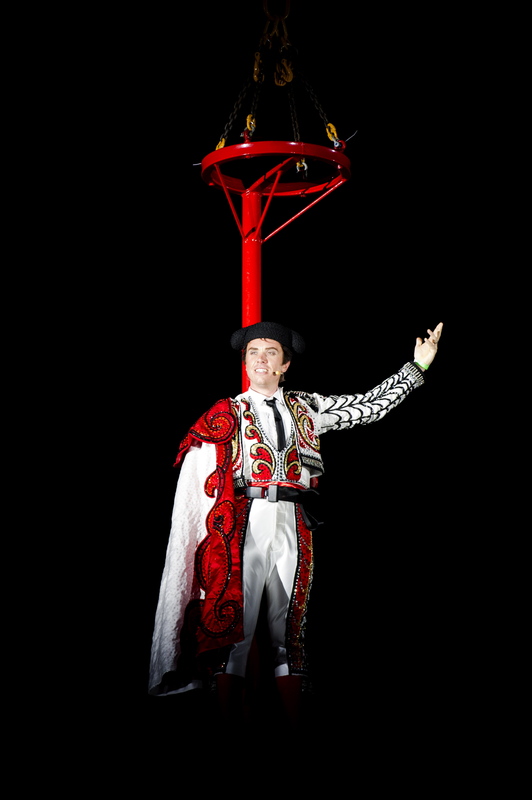 Escamillo, presented as a Hollywood Rat Pack type star, wears an incredibly glittering outfit as he is flown in for the climactic bullfight. The three starlets who accompany his first appearance wear particularly gorgeous silver and black gowns. A test of the effectiveness of a staging like this is to consider what has been achieved that could not be done, or not done as well, on a traditional stage. Director Edwards assists the potentially large number of newcomers in the audience by keeping storytelling crystal clear. A brief prologue effectively sets up the fiery interaction between Carmen and Don Jose. 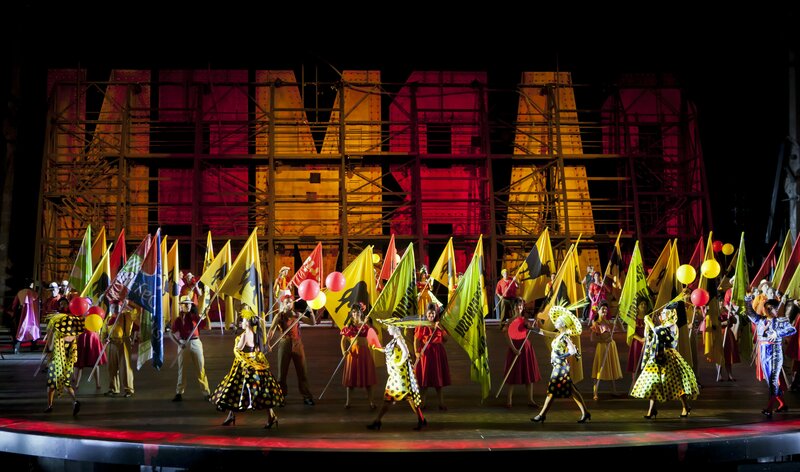 Micaela’s purity and Escamillo’s swagger contrast clearly with Carmen’s passion and Don Jose’s gradual corruption. 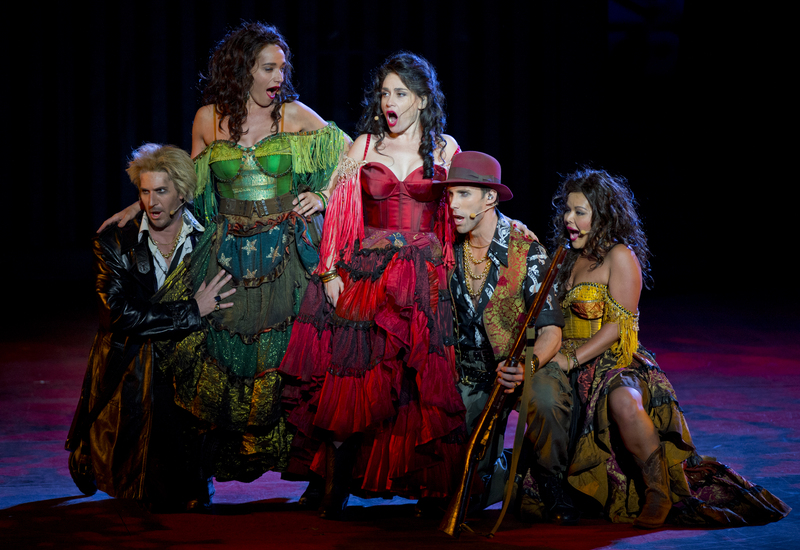 Deft touches include Carmen held on a long rope by Don Jose after she is arrested for brawling, Carmen stalking around the circumference of the stage like a sulking cat when Escamillo is the centre of attention at the tavern, and the positioning of Micaela high above the stage when she is discovered at the smuggler’s lair. While there was a spark of involvement missing early on, the atmosphere improved as the night progressed, building to a tense finale. One criticism of the staging is that the final image of Escamillo with a slaughtered bull is questionable given that it is almost identical to the final image in the current Met Opera production by Richard Eyre. Maestro Brian Castles-Onion keeps the large orchestra playing at a clipping pace, creating quite a thrilling rendition of the score. Sound design by Tony David Cray is miraculous indeed given the limitations and obstacles of outdoor, amplified performances. If there is an element that still needs some adjustment, it is that the orchestral music is somewhat more prescient in the sound mix than the voices. Overall, solo and chorus singing is incredibly clear, aided by superb diction from the singers. The work of lighting designer John Rayment can also only be described as nothing short of miraculous, with such precise detail achieved on such a massive scale. The palette of glowing reds and oranges is consistently beautiful, and the eye is drawn precisely to every detail of the action. 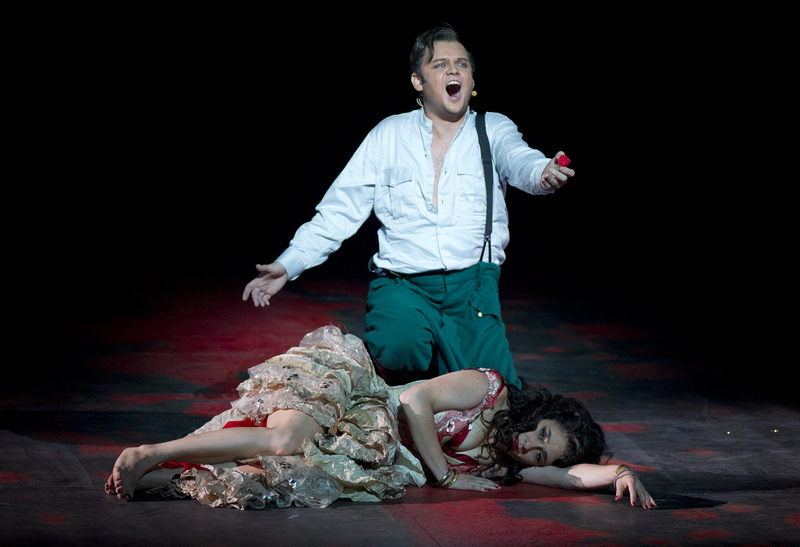 An example of Rayment’s mastery comes in an act two scene between Carmen and Don Jose. All light is removed except for two crossed spotlights on the passionate couple and suddenly we are not in a giant arena but are witnessing an intense and intimate moment. Choreographer Kelley Abbey contributes enormously to the enjoyment of the piece, not only filling the stage with swirling movement but also being incredibly mindful of the storytelling. A highlight involving most of the company is the flamenco-styled stamp/clap routine at the start of act two. One last mention for the production team is the excellent duel between Don Jose and Escamillo in act three by fight director Kyle Rowling. Central to the success of the evening, above all the glitzy trappings of design, is the superb performance of Rinat Shaham as Carmen. In a supremely athletic and sexually charged performance, Shaham absolutely commands the stage, easily connecting with the audience across the enormous space. Even in moments when she is not the centre of attention, you cannot help but look at Shaham to see how Carmen is reacting. An acclaimed Carmen of the world stage, Shaham has a voluptuous, highly expressive voice, and while it is possibly a greater pleasure to hear her sing live, she is very well served by the amplification here. The fact that Ukrainian tenor Dmytro Popov is making his role debut as Don Jose is quite surprising given his strong performance. Popov’s tenor voice has an effortlessly thrilling tone, and the true strength of his voice was demonstrated in one very brief moment when a couple of notes were sung un-amplified and could still be heard clearly. Popov acted Don Jose’s journey from proud soldier to broken, love-crazed criminal with considerable distinction. The role is clearly an excellent fit, and is surely one he will perform again in the future. Andrew Jones sings the role Escamillo with flair, capturing the dynamic presence of the beloved toreador with ease. Adrian Tamburini brings a distinguished presence to Zuniga, singing with a rich, commanding bass. Aria Savadiwong and Tania Ferris are a lively pair as Frasquita and Mercedes, singing with particularly clear enunciation in the act two quintet. Strong support also comes Samuel Dundas, his baritone voice in pure and attractive form. Congratulations to chorus master Michael Black for the excellent harmonies and diction of the ensemble. The chorus of cigarette girls sounds especially beautiful. 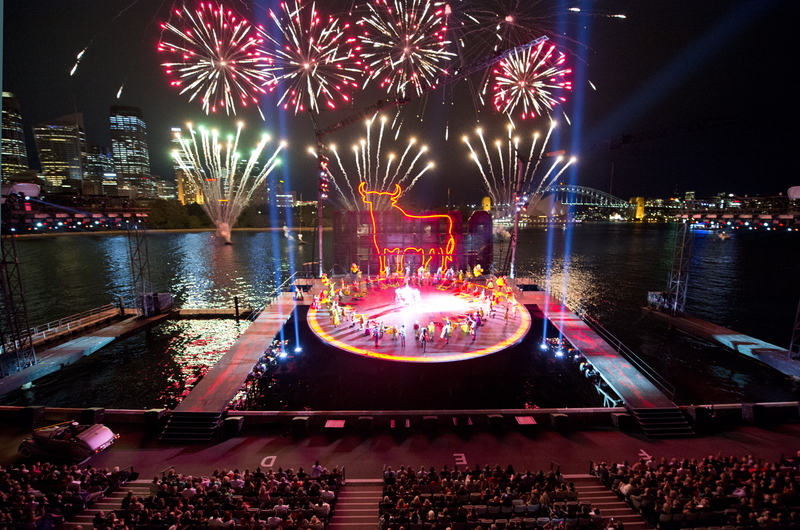 Handa Opera on Sydney Harbour is a world class event that is set to be enjoyed by thousands again this year. The dedication and talent of hundreds of artists is on display, and the result is galvanizing to Australia’s arts scene overall. Afficionados and newcomers will find plenty to enjoy at Carmen. 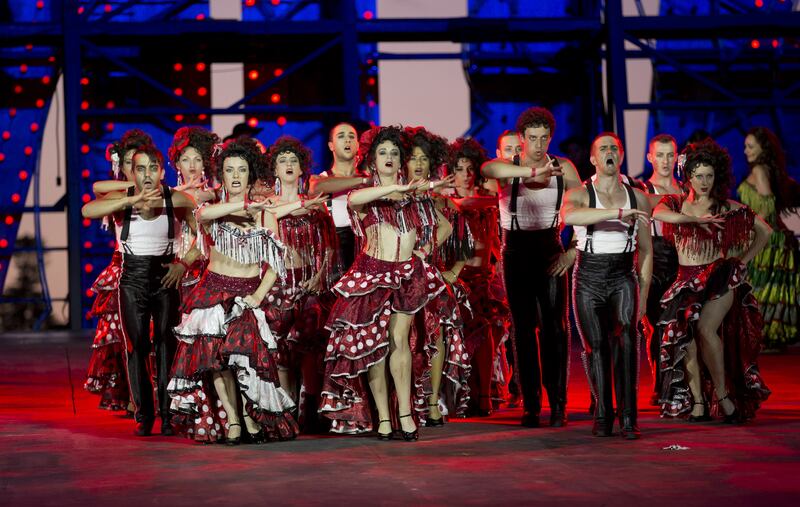 Carmen plays at Fleet Steps, The Royal Botanic Garden, Sydney until 12 April 2013.